Hope you like the new look for the site sign our guestbook telling us what you think of it. This site is made for the pure enjoyment for Westlife fans (corny). I hope you enjoy this site coz I took ages makin' it! 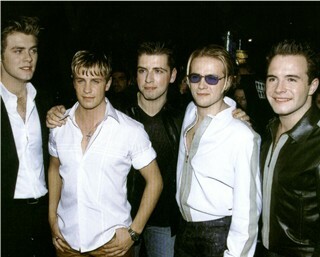 P.S I luv Westlife forever. Kian is well fit!!! Nix are gorge! But don't worry Bry & Shane we luv ya 2! And Mark looks well fit with a goatee! Check out the Poll & Quizzes. Also please can u vote for my Website on Vote For Me. Thanx! WOW WE'VE JUST ANOTHE AWARD FROM KIAN EGAN ONLINE. CLICK HERE TO SEE IT! Hope you like our new look for the site sign our guestbook telling us what you think of it. This site is made for the pure enjoyment for Westlife fans(corny). We hope you enjoy this site coz we took ages makin' it! P.S We luv Westlife forever. Kian is well fit!!! Shane & Nix are gorge! But don't worry Bry we luv ya 2! And Mark looks well fit with a goatee! Check out the Updates page to see whats new.